U.S. Geological Survey ($45,000)This award is the second Fund for Lake Michigan grant that supports research on leaf collection as it relates to phosphorus loading in urban areas. 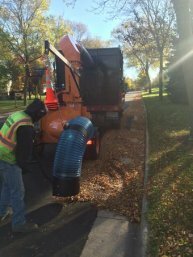 The first grant, which began in 2013, found that up to 80% of phosphorus runoff in urban areas comes from leaves left in the streets during rain events. This $45,000 award now supports another study to evaluate the effectiveness of various leaf collection methods to reduce the amount of leaves that contribute so heavily to phosphorus runoff. The study’s findings will be distributed among its partners: the Department of Natural Resources, the City of Madison, Dane County, and the Clean Lakes Alliance.